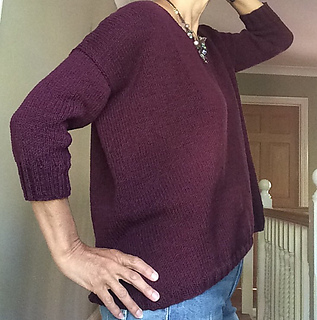 This v-neck sweater is a classic box style which includes a lace panel worked across the centre back. 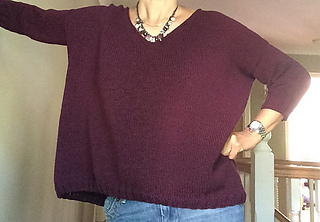 The modern loose-fit style is knitted without any body shaping, plenty of positive ease and 3/4 length sleeves. It’s worked bottom-up in the round until the split for the sleeves where the front and back are then worked separately back and forth. 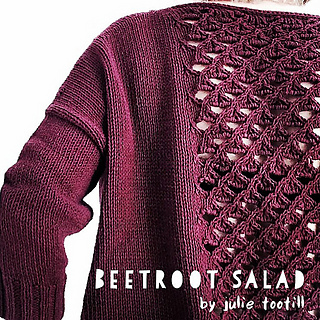 In keeping with the simple design there is no neckband. The top back is finished at the neckline with the addition of an i-cord edge. 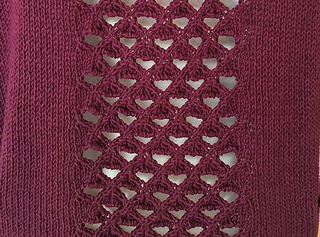 The lace panel is knitted in a triangular lattice stitch called Grand Eyelet Lattice. It’s an 8 stitch, 8 row repeat knitted over 40 stitches across the centre back of the sweater. It starts after the bottom rib and continues for the length of the back. This pattern has been written up quickly from my project notes after an enquiry about it on Ravelry. At the moment it is just one size but the nature of the design means that it would be easy to modify to suit other sizes and yarns. If any errors or inconsistencies are found please let me know and I’ll amend asap. 450g of aran weight cotton is recommended (or use a yarn of choice to achieve the required gauge). 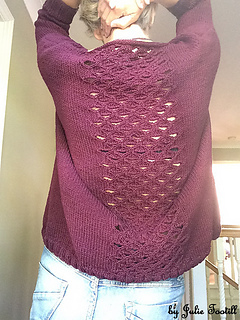 Almost forgot to mention that it’s my first downloadable sweater pattern! 09/08 - Pattern updated - Nothing major but the pattern now includes a couple of finished measurements plus ‘negative ease’ has been replaced with ‘positive ease’ in the description…..what was I thinking? ?